Now I've said on numerous occasions that I am a huge fan of the clear pint containers that Talenti uses for their Gelato. I've saved all but one container and re-tasked them all, often as outside toys for the kids (nothing like a afternoon playing restaurant in the dirt). I was happy reusing this when but then I saw the glowing mason jar project and had an idea. Why can't I make the Talenti jars glow? Alright, supplies are found and we are ready to rock. 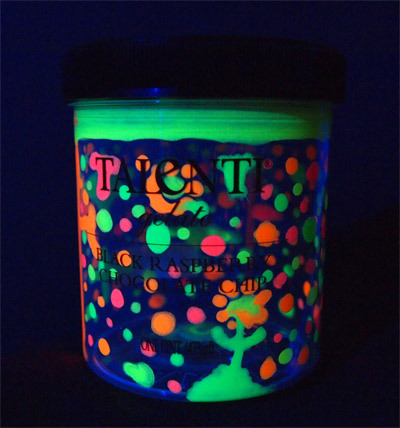 We've got folkArt acrylic glow paint from Walmart (also at say Michael's or AC Moore). 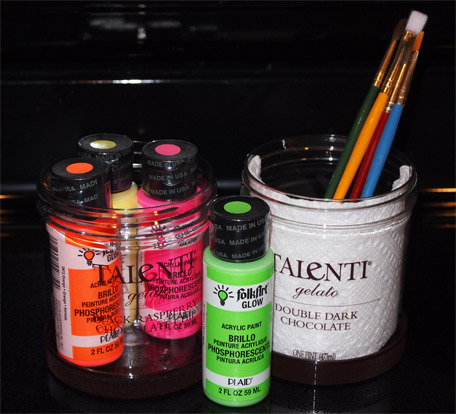 I've got a four paint brushes, two clean Talenti containers, and a daughter ready to paint. We opened the jars and set about our task. This is my jar and I thought it was fun but harder than it looks. I should probably admit that it doesn't glow like this naturally (you may have noticed the purple glow of a black light). Actually, you may have also noticed that you can't really tell the difference between the yellow and the green. Ok, so there were two problems with this project. 1) It's really hard to paint on a cylindrical surface. I mean, I managed by keeping most of my work small and by frequently rotating the jar, but my daughter got so frustrated with her paint running that she wiped her container clean and started over. 2) The folkArt paint doesn't actually glow that well with the charge from a normal light bulb. Oh its fairly bright for a little while but it quickly fades off. In retrospect, I'd probably go with a stronger (and more colorful) paint from coolglow or glow inc.
Now, this was actually a project we did over the summer, but I couldn't get a good picture of it, so unfortunately this post sat as a draft for a very long time.... until Talenti decided to have a pint recycling photo contest so I picked up a new blacklight this week and finally snapped a picture. What a great idea to encourage people to reuse their containers. If you want, you still have time to enter!